Last week it was the voories, this week it is the show-ponies. 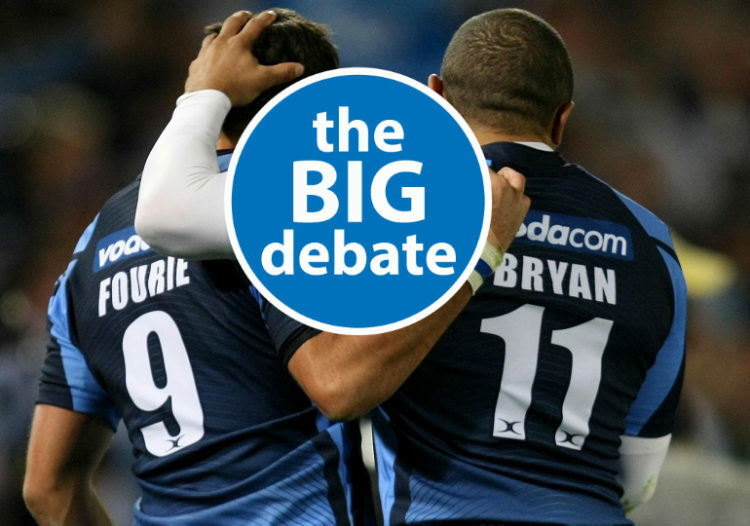 With just the playoffs to come, TANK and ZELIM debate which backs were the greatest in Vodacom Super Rugby history! Where George Gregan won titles with an all-star cast outside him, Fourie du Preez turned lesser talents into three-time champions. Andrew Mehrtens and Morne Steyn were points-machines; Stephen Larkham was a genius tactician. Dan Carter was the perfect balance. For my money, Umaga is as close as you can get to the ultimate back. He was big, quick, agile and skillful, tactically aware and bold without being reckless. I wouldn’t dig in my pockets if Mortlock was 5c short for a packet of smokes, but there’s no denying his qualities on the pitch. Stirlo played a direct game complemented by some sweet goal-kicking – only three players have scored more points in Super Rugby history. Caucau only made 13 appearances in Super Rugby. He scored 15 tries. Yes, Doug Howlett and Caleb Ralph own the career try-scoring records, but if there was only time for one more play to score the game-winning try, I’d want the ball to go to Rupeni in his prime. That leaves the fullback position which reads like a Who’s Who of the comp’s most famous names – Israel Folau, Chris Latham, Christian Cullen, Ben Smith, Percy Montgomery, Andrew Walker, Andre Joubert, Matt Burke and Mils Muliaina. I’ve handed the No 15 jersey to Super Rugby’s best all-rounder, Joe Roff. The thinking man’s fullback, Roff was just as comfortable clicking on his seatbelt for high-speed collisions when the situation called for it. CLICK HERE to see the ultimate pack debate. Once again I have to side with Tank on this one. That backline is perfect in my opinion. What I wouldn’t give to have seen these players play together. It’s a shame that players like Ben Smith and Julian Savea didn’t make the line-up, as they are significant talents! The same can be saig Lote Tuqiri and Chris Latham from Oz. But I’ll stick to Tank’s line-up. Your check is in the mail Chris ? I think you guys are a little besotted by players Australasian and tend to overlook the local talent! Not one mention of Morne’ steyn? Like him or not, he remains the second highest points scorer in the competition, despite not having been in the mix for some years now! Surely a mention, gents? Different opinions are what makes the world go round. Steyn ahead of Carter or Barrett? Joubert pure class, agreed. Came close in my side, but Cullen was a game chager of note! Jaque Fourie, also not finding a place on your lists. 98 caps and 185 points, surely in the mix? I’d battle to pick a team without Cullen and Joe Roff in it. Also while Umaga was special, the Aussies like Horan and Little weren’t mugs either. I’m gonna have to side with Tank on this one. My only change would maybe be Jaque Fourie at outside center and potentially Andre Joubert at fullback. It’s tight between him and Christian Cullen. Tank has Lomu who I don’t think we can leave out but Nonu was not the best 12 in super rugby ever. I can see the argument for smith who was a genius that was never fully appreciated but I cant fit Nonu into my side. I am not sure but I remember umaga more as a 13? Nice to have these little debates about who was the best but imo a bit of an exercise in futility. These players played across three decades and the rules, training, conditioning as well as skill levels have changed. Centres these days have very little room to shine with defences now spread across the field as soon as a ruck is formed never mind lost. So comparing these players over this period is pretty well based on perceptions and is highly subjective. True the players picked by the writers are or were classy in their time but the best players in their positions as of today over that period ? Who knows. Another point is that a player in the NZ teams over the last decade is more likely to have shone because he is surrounded by equally skilled players around him, has coaches of world class as well as a game plan to match. It’s no wonder that the chosen few on this site come mainly from that part of the world. For an example would Habana have starred for the Bulls if he was up against some of the giant, yet fast and skilled wings who have plied their trade in SR in recent years ? Today these players play in an era where expansive rugby is the order of the day ( excluding our three Franchises that is ) and defence is paramount. Habana was a great finisher but these days wings are called on to be much more and any deficiency you might have is horribly exposed. Habana was of course never a tackler of note. Maybe to be more topical the writers should rather tackle the current poverty stricken state of SA rugby, especially with regard to our three non performing Franchises and the very average start to the Boks under Rassie, in order to stimulate some real debate on this forum. Looking forward to some hard hitting articles. Cheers. I think the article was meant to be a bit of fun and most comment have been along those lines! Don’t agree with your take on SA Rugby- we did really well to take the England series, when you consider just how far down the ladder we had slipped! Much still to be done, but positice progress! FYI we have two franchises in the play offs not one! Perhaps top your wine up a little, to point where it is glass half full! There is nothing better than dreaming about players of old versus players of today. It makes you feel like a kid again trying to imagine the likes of Cullen vs Le Roux, Joost vs Faf De Klerk, etc. It is also nice having these sorts of debates to get our minds off the terrible state of SA rugby even if just for a few minutes. Personally, I agree completely with Tank. It shows the class of player that has graced the fields of Super Rugby that this is so difficult and one could easily pick several best teams.